A classic vision inside the security zones of Strategic Air Force units separated from other units on the French Air Bases. Before the 1976 reorganization of FAS, the tanker units consisted in three separate squadrons the ERVs ( Flight Refueling Squadron ) linked each to one of the three Mirage IV strategic nuclear bomber wings, each of them having so four active squadrons in line. Here CJ belonged to ERV 4/93 Aunis having WWI traditions of the Salmson equipped SAL 10 and 277 flights. At the same time Mont-de Marsan housed ERV 4/91 Landes and Avord had ERV 4/94 Sologne. 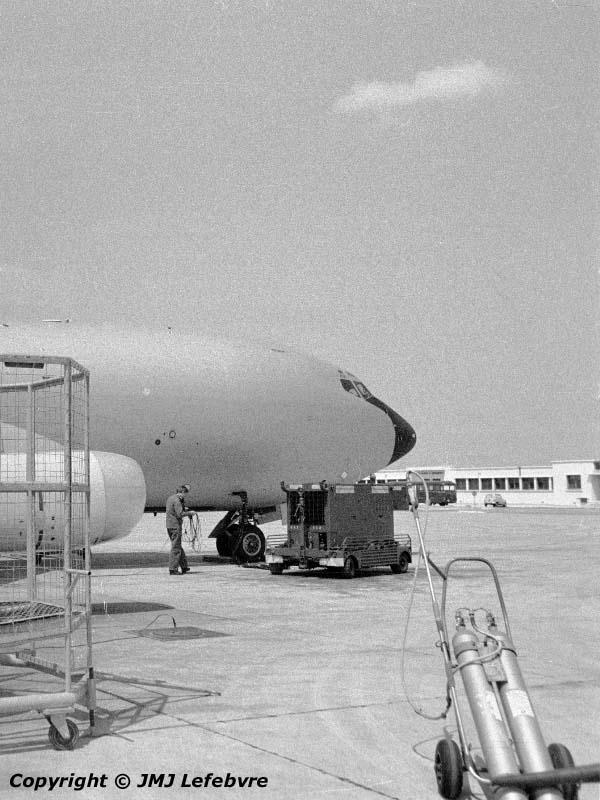 On July 1st, 1976, with FAS reorganizing, these three Air Refuelling Squadrons were housed in the 93rd Air Refuelling Wing becoming ERV 1/, 2/ and 3/93 with their original names kept.